Horc Evader & Troll SpellSmith! As promised, we are giving you TWO classes for the Bloodtusk Ravine area and BOTH of them are coming out tomorrow. As promised both classes will require a reputation rank of 10 for each of the respective ranks to purchase, but after the recent fashion we will be offering a 2000 AC version of each of the classes for those who feel like they'd rather save the time and effort. As promised each of the classes have human versions of the art for the class and a Horc or Troll version of the art as armor which is also Rank 10 Rep. Since we have a lot to go through, let's get down to business. Here are the skill breakdowns for each of these classes. There are two interesting things about this class at first glance. First is that this is our SECOND PET CLASS, meaning that you need a Battle Pet in order to use any of it's skills. You'll be happy to know that the class comes with a Battle Boar which you can summon using the Whistle Skill as long as you don't have any other pets equipped. Just make sure that pets are visible in your options screen. The second thing that you might notice is that, even though most people think that the Horcs are all about brute force, this is a class with light armor which focuses heavily on stacking a lot of Dodge. That is because the Evader is a master of a different school of Horc thought which thinks that being able to take a hit is necessary but to develop the skill to easily side-step your opponents clumsy attacks while developing the ability to command a pet to attack them with bestial fury at the same time is a show of ultimate focus and skill. This class benefits from DEX more than anything else so I suggest Thief Enh for this class. A basic attack taught to all adventurers. 45 mana, 16 second cooldown. Calls a pet to your side or sends it into a rage causing more damage but making you take more damage too. If you don't have a Battle Pet equipped, this will summon the Battle Boar to your side and once its there this skill will increase your damage output but will also leave you vulnerable to attacks, making you take more... if they can hit you. Once you have a good Dodge stack you shouldn't be afraid of using this skill but keep an eye on your life bar. 10 mana, 3 second cooldown. Your pet attack your target causing Damage Over Time while also increasing your Dodge for a short time. Effect stacks up to 3 times. This is your go-to skill. it should be the first thing you do after summoning your pet. Once you have three stacks of Shadow Strike applied, you will have a weak-ish DoT eating away at your foe's life AND you will receive the benefit of having a very hefty Dodge stacked up. Remember that you need to keep three stacks of this skill up at all time but that DoT won't kill your enemy so you need to balance it with the other damage dealing skills. Since it's built on the Warrior mana-regen model you will be getting mana every time you hit, or get hit but you won't be getting hit a lot so keep an eye on your mana. 15 mana, 5 second cooldown. Your pet sniffs out your foe's weak spot greatly increasing you Dodge and Crit but slowing your attack speed for a short time. I'll leave it to you to decide when you use this skill. The Dodge and Crit are VERY nice to have, especially on top of the Dodge buff from Shadow Strike but slowing your attack speed means even LESS mana coming in. It's a question of what you need at the time. Ranking up the class unlocks the ability to get critical hits more often, plus EVEN MORE DODGE... They don't call it the Evader Class for nothing. 20 mana, 6 second cooldown. You decide to put an end to this fight quickly. You call out to your pet increasing you AND your foe's Haste for a short amount of time. There are various uses for this skill. If you just activate it without using any other skills you should get a lot of mana rather quickly for a short amount of time. Or you CAN use it counter the slowing effect of smell fear but the price is nearly doubling your foe's attack speed for a while. It app depends on how much Dodge you have stacked up. You sense that your foe is near defeat which causes a burst of incredible speed for a few moments. From time to time you will see yourself suddenly start attacking at Fast Forward speed, increasing your damage output AND your mana regen for a while. You will notice that THIS class is the first class in a while that has no healing skill. The idea is to use your skill as a player to keep your Dodge so high that you don't NEED to heal yourself, but you can always use your potion slot for that if you want. This is a warrior/caster who is very multi-talented. You have an AOE that can attack many foes at once, a decent amount of single target damage and chance of stun which is great for solo-ing or taking on bosses and a self-heal which is ALSO a HUGE buff to ALL of your skills. This class is all about representing the Trolls academic interests as well as their mastery of the magical arts. It's an elegant class more like a razor than a broadsword. You need to know which skills to use and when and there is a low of room for creativity with how you use them. This class benefits from INT more than anything else so I suggest Wizard Enh for this class. 35 mana, 10 second cooldown. Calls on the power of electricity to arc from one foe to the next, slowing all of their attack speeds. This is a really nice first skill for a few reasons. First off, unlike Shaman, this lighting attack doesn't weaken as it arcs from one to the next. Each enemy receives the same damage. Similarly they are all slowed the same amount. Of course, if you're not careful you will have an entire room of monsters on you and then it won't matter HOW slow they attack. 25 mana, 5 second cooldown. A freezing fire that will cause moderate ice damage and slow your enemies with a chance to stun them. This is a GREAT skill. The damage is moderate but at a 5 second cooldown you end up causing a LOT of damage. The stun is always a nice treat but the slow stacks with the slow from the first power causing your foes to attack you at a crawl. Convert your own energy into mana but slows your attack and lowers your damage for a while. Like the Necromancers of DoomWood, trolls have learned to consume their own life-force and convert it into much needed mana, which is dangerous enough, but the speed and damage debuff will make you think twice before using this skill. It can be a life-saver but only if you have the skill to see when its needed. Ranking up the class unlocks the ability to get critical hits more often, while also doing more damage overall. In short, this is a massive buff to the entire class. 20 mana, 5 second cooldown. Stacks up to 5 times. Heals you for a little bit, increases the effectiveness of all other skills and increases your chance to crit on your foe with each stack. This skill is flat out AMAZING. It speaks for itself but in case you missed it... it is a SELF-HEAL with a 5 second cool-down that makes ALL of you other skills stronger with each stack AND raises your chance to crit on a single target. it keeps you alive and seals your foe's fate at the same time. It's the best reason to rank up that I've ever seen. Random chance to double your attack speed for 10 seconds. Like the Evader, this rank 10 passive will also have you breaking into frenzied spell-casting giving you the chance to burn your fow down before they know what happened and since you can make your own mana, feel free to go nuts! So there you have it. People have been asking me which is better against the other one in PvP. Dumoose and I spent some serious 1v1 arena time trying to figure out the answer to that question and we STILL DON'T KNOW! It was really about 50/50 with neither being clearly superior to the other one so if you were hoping to run into the arena against the faction you're against and wipe the floor you might want some practice first just to give you that edge. 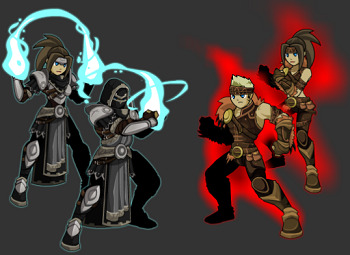 Each class will be in the Rep Shop for its own faction in Bloodtusk and you will be able to find the AC versions there as well as Itzachi's Class Shop in Battleon. If you're in a hurry to Rank your new class up, don't forget that Itzachi also sells the CLASS POINT BOOST in her shop as well. The Black Friday Shop and the Harvest event will be closing tomorrow and Quibble will be leaving on next Monday but don't worry, he always returns near Frostval with a bunch of great Frostval Items! if your family is the gist giving kind, you might want to be prepared and ask for an Artix Points card for the holidays. Krellenos sets Chaos in motion! Good. Evil. And CHAOS! All forces are in play this week as Krellenos reveals his plans for your Hero, the Alliance Leaders, and all of Lore! Oh, and did we mention he just happens to have a 20-foot tall Serpentress at his command? That lowly snake creature has morphed into a Chaorrupted Bloodtusk legend: the Gruaige Baas! 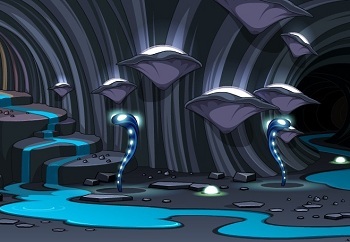 This Friday, journey under the heart of Bloodtusk Ravine through a mystical cavern system to find the Alliance Leaders, Krellenos, and the Chaos Beast itself! If you fail, not only the Alliance but all of Lore will be torn apart by fear and the certainty that their loved ones will betray them... just as Krellenos deceived his! Your future rests on what these caves contain. Draw upon your skills as a Hero to DEFY the destiny Krellenos Sees for you! Horc Evader and Troll Spellsmith Classes! Whether you prefer Melee or Magic battling, you'll find a class that will stun you! (So you better make sure to put your points in Dodge!) Tomorrow Cysero will post the skill writeups for the Horc Evader and Troll Spellsmith classes! Yesterday Artix posted a tantazling concept sketch Dage the Evil drew up for them. Below you'll find the fully-Flashed art, fully coded and ready for testing! Both classes are available by repping up to Rank 10 (in Horc for Evader, in Troll for Spellsmith), but we're also offering AC versions of each class! Cysero and Dumoose went head to head today testing the classes' balance in PvP. With that, I'm signing off to go email Nulgath and Samba the cutscenes they need to animate, then finish off the last of the cranberry sauce I made yesterday. (Who says it's only for Thanksgiving?!) Enjoy the previews and see you in... a few hours! PS: Make sure you check out Cysero's post on AE's donation to Child's Play! It's all thanks to YOU guys that we were able to become Platinum sponsors! Gamers helping kids... who could grow up to be gamers. It is a beautiful cycle! PPS: If you're up to date on the Bloodtusk storyline, why not head to Bloodtusk and check out Khasaanda? Looks like Krellenos has vanished and his sister is revealing some all-new information that should tantalize and tease with hints of events to come!